The stars are perfectly aligned for the 2015 Singapore Grand Prix, thanks to a special addition of S$10 million worth of diamonds to Amber Lounge’s iconic fashion show. Think post Formula 1 evenings cannot get any better than Amber Lounge’s star-studded fashion shows, international celebrity guest list, and renowned deejays spinning tunes through the night? Then this year’s event has just hit a new high, thanks to the inaugural fine jewellery fashion showcase by the World of Diamonds Group. To start things off, former Miss Universe Singapore models will be coming down the runway dressed in made-to-measure pieces by homegrown luxury label, Chi Chi von Tang. 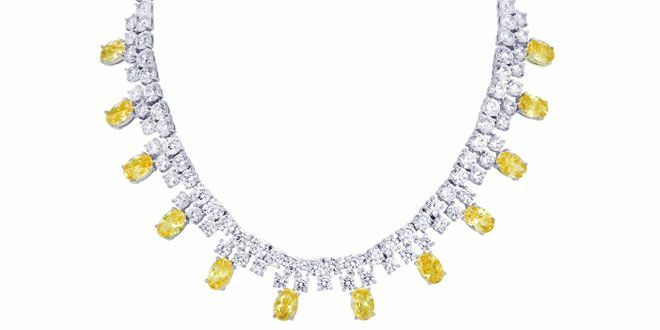 Still, the real stars of the fashion show are the dazzling, multi-million dollar diamond necklaces designed by the World of Diamonds, which include ‘Cupid’s Love’, dotted with yellow diamonds, the dual diamond layered ‘Diané’, and ‘Vegas Beauty’, a true stunner with 17 individual cascading diamonds. As if the S$10 million worth of jewels are not extravagant enough, the diamond corporation will also have an exclusive showcase for the event’s elite crowd. The Royalé Dream collection includes a stunning, vivid blue, 0.85-carat diamond, as well as three fragrances produced by Spanish luxury perfume house, Cuarzo The Circle. The perfume bottles come coated in 24-karat white, rose, or yellow gold, and if you are wondering where the coloured diamonds are, just peer into the perfume bottle for your answer. So, if you have S$190,000 to spare, then these one-of-a-kind items are yours to flaunt.